Welcome to what I hope will be an ongoing series of Clojure do’s and don’ts. I want to demonstrate not just good patterns to use, but also anti-patterns to avoid. Some of these will be personal preferences, others will be warnings from hard-won experience. I’ll try to indicate which is which. concat is a tricky little function. The name suggests a way to combine two collections. And it is, if you have only two collections. But it’s not as general as you might think. It’s not really a collection function at all. It’s a lazy sequence function. The difference can be important. The devilish thing about this function is that it works just fine when n is small. 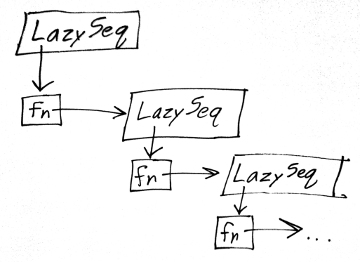 lazy-seq is a macro that wraps its body in function and then wraps the function in a LazySeq object. Calling seq forces the LazySeq to invoke its function to realize its value. Most Clojure sequence functions, such as first, call seq for you automatically. Printing a LazySeq also forces it to be realized. In the case of our concat chain, each LazySeq’s fn returns another LazySeq. seq has to recurse through them until it finds an actual value. If this recursion goes too deep, it overflows the stack. This is a nasty bug in production code, because it could occur far away from its source, and the accumulated stack frames of seq prevent us from seeing where the error originated. ;; "Elapsed time: 830.66655 msecs"
;; "Elapsed time: 0.075421 msecs"
Don’t use lazy sequence operations in a non-lazy loop. If you’re using lazy sequences, make sure everything is truly lazy (or small). If you’re in a non-lazy loop, don’t build up a lazy result. It’s not just concat either — any lazy sequence function could potentially cause this. concat is just the most common culprit. Update October 3, 2015: My friend Jon Distad has come up with a way to avoid this bug with a different implementation of concat. See Concat implementation without stack overflow on the Clojure mailing list. Depending on your JVM settings, it may take more or fewer iterations to trigger a StackOverflowError. Thanks for this, you saved me time and frustration. I had read this and days later encountered a lazy/eager scenario so I knew what the root cause was. Next Post: Clojure Don’ts: isa?